Designed primarily for the EF lens mount used on Full Frame Canon DSLRs like the EOS 5D MKII the EF 35mm f/2 IS USM offers a wide-angle field of view ideal for landscape or architectural photography. It’s also compatible however with the EF-S lens mount where, taking into account the x1.6 ‘crop factor’ on Canon DSLR utilising the smaller APS-C sensor, it offers a longer 56mm equivalent focal length making it more suited to portraiture and general photography on these cameras. Updated with Canon’s lens based Image Stabilisation or IS technology Canon claim the EF 35mm f/2 IS USM offers up to 4-stops of anti-shake performance. That means when shooting static subjects slower shutter speeds of around 1/2sec can be used without images suffering from camera shake. There’s also a new Ultrasonic Motor, or USM, for quick and quiet AF, as well as instant manual focus override by simply reaching for the focus ring. At $849 it’s pretty expensive however and with the original EF 35mm f/2 still on the market and available new for much less money is this updated version worth the extra cash? Lets take a look at the DxOMark Lens Metric Scores for the Canon EF 35mm f/2 IS USM to find out. A DxOMark Overall Score of 29 the Canon EF 35mm f/2 IS USM currently ranks as the 4th best lens tested on the Canon EOS 5D MKII. With an Overall DxOMark Score of 29 tested on the Canon EOS 5D MKII the Canon EF 35mm F/2 IS USM ranks 4th overall just behind the Sigma 85mm f/1.4 EX DG HSM, Canon EF 100mm f/2 USM and another wide-angle option the $899 Sigma 35mm f/1.4 DG HSM A. With a Lens Metric Score for Sharpness of 17P-Mpix tested on the Canon 5D MKII the Canon EF 35mm f/2 IS USM offers an improvement in Sharpness over current wide-angle offerings such as the Zeiss Distagon T 35mm f/2 ZE Canon, with 15P-Mpix, or the Samyang 35mm F1.4 AS UMC Canon with just 12P-Mpix. That said edge sharpness isn’t perfect with some drop off at the wider aperture settings and slight barrel distortion is evident, too. A Lens Metric Score of -1.8Ev for vignetting indicates lens shading is also very strong at the maximum f/2 aperture but generally this is a bright lens as its Transmission Score of 2TSTop indicates. The Canon EF 35mm f/2 IS USM lens ranks 2nd for wide-angle lenses tested on the Canon 5D MKII just behind the $899 Sigma 35mm f1.4 DG HSM A. Scoring 17P-Mpix for Sharpness the Canon EF 35mm f/2 IS USM is one of the sharpest wide-angle primes available for the Canon 5D MKII, just behind the Sigma 35mm f/1.4 DG HSM A. With a Lens Metric Score of 17P-Mpix compared to 15P-Mpix the updated Canon EF 35mm f/2 IS USM boasts a 15% improvement in Sharpness compared to its predecessor. With the old 1990’s version available for just $320 there’s a chasm in price compared to the recent $849 version. So alongside the additional IS and USM features what does that extra $529 buy you in terms of performance. Well, dive back into our review of the old Canon EF 35mm f/2 and the main criticism was poor sharpness at the edges using wider apertures and that, thankfully, has been corrected. With a DxOMark Score of 29 points for the new version, tested on the Canon 5D MKII, compared to just 22 for its predecessor, the Canon EF 35mm f/2 IS USM delivers 30% more information. An increased Sharpness Score from 15P-Mpix on the old version to 17P-Mpix represents a 15% improvement in sharpness overall and although results in the centre are a bit better it’s in the corners where the big advances have been made. Edge Sharpness has improved 15% and although, like you’d expect from a wide-angle, there’s some drop off at the wider aperture settings the results are a significant improvement. If it’s homogeneous sharpness you’re after however then simply stop the lens down to f/5.6 and edge to edge sharpness is a reality all the way through to f/22. The other big improvement is the brightness of the new Canon EF 35mm f/2 IS USM and with a Lens Metric Score for Transmission of 2TStop compared to 2.3TStop, this latest Canon 35mm lens is +0.4Ev brighter. Distortion, Vignetting and Chromatic Aberration are very similar between the two however with no discernable difference in real world terms. With the aperture wide open at f/2 the updated Canon EF 35mm f/2 IS USM offers a big improvement in Edge Sharpness over its predecessor. The new Canon EF 35mm f/2 IS USM’s other big advantage is its brightness and with a TStop Score of 2TStop compared to 2.3TStop it’s +0.4Ev brighter than its predecessor. 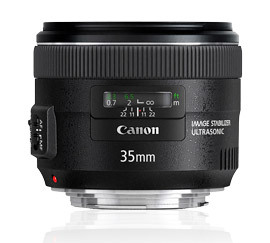 So if you’ve ruled out the cheaper original version and decided to splash the big bucks is the Canon EF 35mm f/2 IS USM the lens to go for, or is there a better Canon wide-angle prime available? Of the three Canon wide-angle primes released in 2012 the EF 35mm f/2 IS USM is the best with an Overall DxOMark Score of 29 compared to 26 for the 24mm & 28mm versions. The $799 Canon EF 28mm f/2.8 IS USM and the $849 Canon EF 24mm f/2.8 IS USM both offer a wider field of view than the Canon EF 35mm f/2 IS USM but a smaller f/2.8 maximum aperture. With a DxOMark Score of 29 the Canon 35mm ranks best overall (tested on a Canon 5D MKII) but with 26 points the others aren’t far behind if you need a wider angle. In terms of Sharpness all three perform well but with a Sharpness Score of 17P-Mpix both the 35mm & 24mm versions have the edge, compared to 15P-Mpix on the 28mm version, and as such are around +15% sharper. That’s not the whole story though as at f/2.8 – the maximum aperture on both the 24mm & 28mm versions – the 28mm offers the most homogeneous performance, which could be an important factor depending on what you’re shooting. Offering the longest focal length of the three lenses the Canon EF 35mm f/2 IS USM has the advantage in terms of physics and at f/2.8 it’s much brighter than its two rivals achieving a Transmissions Score of 2TStop compared to 2.8TStop, making the 35mm 1 Stop brighter overall. Lens shading is also more difficult to control at wider focal lengths and aperture settings so it’s no surprise that the Canon EF 24mm f/2.8 IS USM has the worst Vignetting Score of -2Ev compared to -1.8Ev on the 35mm and 28mm versions with the effect at f/2.8 being controlled best by the Canon EF 35mm f/2 IS USM. Attached to a Canon EOS 5D MKII it ranks 4th overall and 2nd for wide-angle primes, just behind the Sigma 35mm f/1.4 DG HSM A, which at a similar cost offers the same focal length, a wider f/1.4 maximum aperture but no Image Stabilization. You can read our DxOMark review of the Sigma 35mm f/1.4 DG HSM here. A Sharpness Score of 17 P-Mpix for the Canon EF 35mm f/2 IS USM, compared to 15M-Pix for its predecessor, is an improvement of +15% and crucially it performs much better in the corners of the frame, which was the weakest aspect of the original. It’s not the widest Canon prime available with the Canon EF 24mm f/2.8 IS USM and Canon EF 28mm f/2.8 IS USM available at a similar price point and although they don’t quite achieve the dizzying heights of the 35mm they put in a very good performance, too. At around the $800 – $849 mark however all three lenses are expensive but there aren’t any cheaper alternatives available unless you’re prepared to live with the relatively poor Sharpness of its predecessor the $349 Canon EF 35mm f/2. If you want the ‘fast’ f/2 maximum aperture and desire top-quality edge-to-edge from a Canon wide-angle prime you won’t go far wrong with the Canon EF 35mm f/2 IS USM.